Royal & Langnickel Essentials graphite sketching set includes all the necessary tools needed to start your art adventure today. This set includes excellent quality graphite pencils, graphite and charcoal sticks, charcoal pencils, woodless graphite pencil, erasers, and sharpener for the pencil artist. This set is an exceptional value; it contains 21 high grade sketching tools packed in a transparent clamshell for storage and organization. 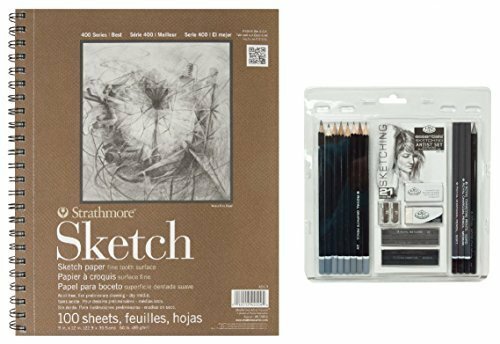 This outstanding set is complete with a general purpose, medium weight sketch paper intended for technique practices or quick studies with any dry media. This package contains one 12 by 9-inch side spiral-bound sketch book with 100 sheets of 60-pound acid free, lightly textured paper. If you have any questions about this product by Royal & Langnickel, contact us by completing and submitting the form below. If you are looking for a specif part number, please include it with your message.